The RJW series of high efficiency dc/dc converters are available as single and dual output versions, 3.3VDC up to 15VDC, with up to 12 watts of output power. They are ideal for telecom and networking applications, and are designed for a 4:1 input range, either nominal 24VDC (9VDC-36VDC) or 48VDC (18VDC-75VDC). 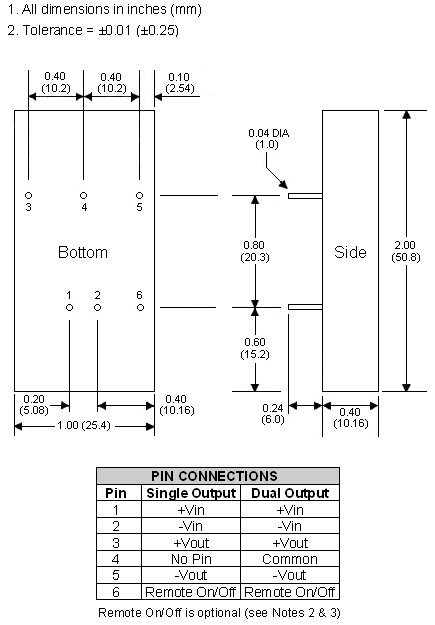 The converter is PCB mountable, and the package has a form factor of 2″ x 1″ x 0.4″. Standard specifications include Pi input filter, excellent load regulation, and short-circuit protection. The isolation voltage meets the >1500VDC telecom requirements. Notes: 1. For negative logic remote On/Off add suffix "R" to part number. 2. To add remote option and pin, add suffix "RC". 3. Remote On/Off models do not have UL1950 approval. 4. All case and pin-to-case dimensions are for reference only unless otherwise noted. 5. All DC/DC converters should be externally fused at the front end for protection. 6. Significant capacitive load at the output of the converter may inhibit the start-up and operation.